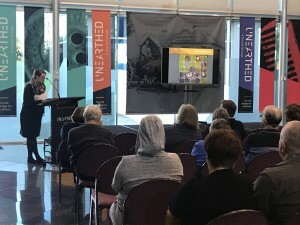 On Saturday the 26th May Dr Michelle Negus Cleary and Bronwyn Woff (pictured) presented the findings of their work the Old Bridge Inn archaeological study in Mernda as a part of Archaeology Week. The Old Bridge Inn archaeological investigations was Victoria’s first historical archaeological offset project. A main aim of the off-set project was to provide opportunities for the community to engage with the archaeology of the Old Bridge Inn and the heritage of Mernda. Some of the initiatives included school group tours, a public open day and volunteer opportunities for archaeology students. the Wurundjeri Land and Compensation Cultural Heritage Council Aboriginal Corporation (WLCCHCAC). Over 10,000 artefact fragments were recovered during the archaeological excavations and surveys, the majority of them being historical artefacts related to European settlement. However, almost 300 were flaked stone and glass tools related to indigenous occupation. Some of these artefacts can be dated to the Mid Holocene, approximately 8,000-5,000 years ago! The European artefacts helped to tell the story of early settlers to the area. Historical records show that the Willis brothers and their men had built a wattle-and daub house on the Plenty River in 1837 and it is possible that this was the Bridge Inn. The land was later purchased in 1851 by Moses Thomas, a well-known figure in the area and he operated the inn with his wife Janet. Through an analysis of the artefacts, the archaeologists were able to draw conclusions about the lives of the people who lived in and frequented the inn. This included discussions of eating and drinking habits, farming practices, what people did with their leisure time and the way that they raised their children. 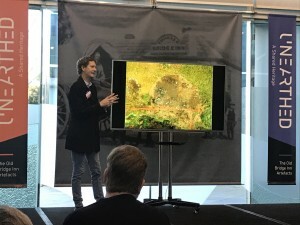 Michelle and Bronwyn’s presentation was preceded by a talk by Jeremy Smith (pictured) from Heritage Victoria, who spoke about other recent projects in Plenty Gorge Park, focusing on the Thomas Mill archaeological investigations. Thank you to everyone who attended, we hope that you all enjoyed the day! Some of the artefacts are on display and the exhibition will be open at the Whittlesea Council Offices until the 29th June 2018.